Watch the widest range of sports entertainment in Ultra HD with Sky Q and get closer to the action than ever before. From 18 July, Sky Sports will be better than ever with a range of new dedicated channels, including themed offerings for the Premier League, Football, Cricket, Golf and F1*. As well as award-winning commentary and analysis there will be brand new shows and documentaries. But, wait. It gets even better. Sky Q customers will also be able to enjoy the best live sport in Ultra HD, including Premier League, F1 and England Test cricket. Sky Q also supports features including Sky Sports News HQ app on your screen while watching live TV, split viewing and multi-angle choice. 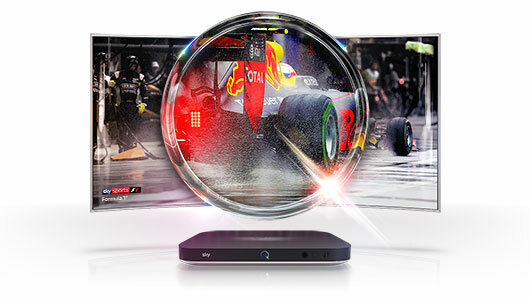 To watch Sky Sports in Ultra HD customers will need the Sky Q 2TB box with a Sky Q Multiscreen subscription and a 4K Ultra HD TV. *The F1 Logo, F1, FORMULA 1, FIA FORMULA ONE WORLD CHAMPIONSHIP, GRAND PRIX and related marks are trade marks of Formula One Licensing BV, a Formula 1 company. All rights reserved.